As the Tribeca ESPN Sports Film Festival approaches, Media Blitz columnist Sam Alipour will be checking in periodically and throughout the festival. SANTA MONICA, Calif. -- As men tussle on the mats inside this storefront Brazilian jiu-jitsu academy, David Mamet stands just inside the doorway, one hand on his silver-stubbled chin, the other pointing to a framed black-and-white photo hanging on the wall. "Isn't it gorgeous?" he wonders, not pausing to hear an answer. In the photo from 1916, two practitioners of Chinese boxing square off in a ring before a packed house, maybe a thousand white men in fedoras, all staring directly at the camera. The film director and devoted jiu-jitsu student spotted it at the Hollywood American Legion Hall, one of the prominent early arenas on the West Coast, while on location for his latest movie, "Redbelt," a drama set in the world of mixed martial arts premiering at the Tribeca ESPN Sports Film Festival. The screenwriter asked for a copy, then handed it over to Street Sports, the academy where he fell head over heels for Brazilian jiu-jitsu. "Every society has its institutionalized form of fighting. Ours is boxing," Mamet continues, still focused on the photo. "But this shows how far back our roots go, how interested we were, even back then, in investigating other forms of martial arts." Eight of these so-called investigators are in this gym. Even in mid-grapple, they're keenly aware of the hullabaloo invading their sanctuary -- and they don't appear to mind one bit. In fact, it's possible that the training session is, at least in part, something of a performance put on for the outsider. Between takedowns, they come over to introduce themselves -- fighters as salesmen, answering questions and offering lessons. Mostly, though, they're excited to see Mamet, the man one fighter refers to as "our fearless leader." After warm embraces, they pass around hot-off-the-press "Redbelt" posters and fight magazines with "Redbelt" blurbs, gleefully perusing photos from the set like preteens swapping Hannah Montana trading cards. In this setting, Mamet, 60, is less like the uber-intense, fiercely independent writer and director responsible for critically acclaimed tough-guy classics like "Glengarry Glen Ross" and more like a goofy kid on Christmas morning. "Redbelt" is Mamet's love letter to this nondescript building along a sun-bleached slab of Ocean Park Boulevard, the men who sweat here and its purveyor, Renato Magno, a BJJ black belt and Mamet's teacher of six years. It's why the notoriously private Mamet, also a celebrated playwright, fire-breathing essayist and a purple belt, has agreed to guide me into his safe haven where, it seems, only two rules apply: Remove your shoes and leave the outside on the outside. Chiwetel Ejiofor stars in David Mamet's love letter to the art of Brazilian jiu-jitsu. His film is about BJJ master Mike Terry (Chiwetel Ejiofor of "Inside Man," "Children of Men" and "American Gangster"), who shuns the MMA circuit out of the belief that competition weakens the fighter, choosing instead to pursue an honorable life by operating a humble self-defense studio and spreading the gospel to West L.A.'s fight world, a subculture inhabited by actors, bouncers, cage fighters and cops. Terry's virtuous existence is threatened, though, when an accident at the studio involving an off-duty officer and a distraught lawyer (Emily Mortimer) puts the black belt in the crosshairs of a shady movie star (Tim Allen, in an effective and nuanced turn) and promoters of a televised MMA event. In the end, he must decide wither to sacrifice his code to protect his honor. Consistent with Mamet's oeuvre, the film crackles with quick bursts of muscular dialogue (like, say, "Take the fight out of your face," and "Everything in life -- the money's in the rematch") spoken by colorful characters brought to life by respected if not marquee actors like Brits Ejiofor and Mortimer, and Mamet regulars Ricky Jay, Joe Mantegna, David Paymer and Rebecca Pidgeon. 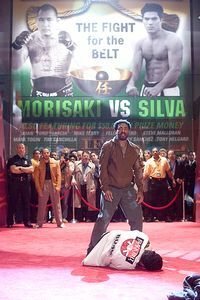 Fight fans might care to know the movie's also populated with some of the biggest names in their beloved world, including Ultimate Fighting Championship legend Randy Couture, lightweight boxer Ray "Boom Boom" Mancini, and martial artists Dan Inosanto, Gene LeBell, Rico Chiapparelli, Enson Inoue, Frank Trigg and John Machado. The training of the actors and choreography of the fights fell to Magno, who was among the first wave of Brazilians to hit the States and spread their art. Mamet's fellow Street Sports students who, like their fictional West Side counterparts, are stuntmen, police officers and aspiring actors, populated the fights themselves. "All of the fighters are my friends or students, and that's because David is very loyal to the sport and to the gym," says Magno, in halting English. "We are lucky to have David, someone who loves the sport, respects and believes in the lessons. It's very much like a family here. He cares about the people at the gym and every movie or TV show he's doing, he brings some of these guys to work, for acting and stunts. And they love him for it." "I didn't even know David was a director, he's such a humble guy," says brown belt Adam Treanor, a Culver City police officer and the inspiration for the film's cop character. "He's progressing very well. He was already a pretty tough guy, but now he can choke out people who don't listen to him on the set." Mamet, a 5-foot-8 former high school wrestler and boxer, was introduced to the school six years ago by Ed O'Neill, a jiu-jitsu practitioner once known as Al Bundy, now a Mamet flick regular. Mamet trains here twice a week, sometimes in 90-minute private sessions with Magno. After sessions and even during off-days, the gym regulars will gather to discuss fight and philosophy in what Mamet calls "a luncheon club," which is probably not as cute as it sounds. 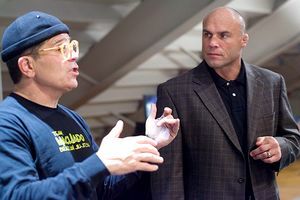 Mamet (left) uses real MMA fighters like former champ Randy Couture. "Jiu-jitsu is a very, very different way of looking at conflict," Mamet explains. "The essence of jiu-jitsu is, Don't oppose force to force. Learn to conquer yourself. Do away with your anger, which can only hurt you in a confrontation. Don't take on the other guy's weight. Someone wants to call you names, so what? Somebody wants to hurt you? OK, so what? If you clear your mind, you can actually see what's being done to you, what the other person's intent is, and instead of opposing, you can end the confrontation by leaving or by subduing the other person. You don't have to expend your force but, nonetheless, by understanding, by gaining a superior position, you can prevail in a conflict. It really does help me everywhere." When asked to recall his proudest moment during six years of training, Mamet takes a beat. Then: "My first instinct is to say when I got (the purple) belt. But I think my proudest moment was a time when I actually employed some of the philosophy that Renato teaches here outside the academy. "And I'm not going to tell you where," he adds. Well, here's one guess: Hollywood. Between the necessary fight scenes, Mamet weaves some of his favorite themes, like honor and betrayal, through a genre-blender that is parts sports film, fight film and samurai film, where an honorable warrior must battle the establishment. Like most Mamet flicks, though, "Redbelt" isn't big on action, star power or budget (a reported $7 million), so in this way, the film is also something of a parable about Hollywood, and the story of the making of this movie: The honorable (martial) artist grappling with Captains of Commerce. Despite MMA's increasing popularity and appeal to the coveted 18-34 demographic, Hollywood has been reluctant to get in line with MMA-themed big-screen fare. "Everybody in Hollywood passed on it," Mamet says of his arduous journey to sell the project. "One of the things I talked about (in the pitch) was the demographics of UFC. Look at who goes to these fights. Look at how many follow on TV. It's huge among young males, exactly the demographic studios are trying to reach. You're wondering how you can get these people to see a film? Well, this is your answer. The reaction was baffling. Tim Allen leaves his usual comedic roles in playing a shady movie star. "The problem is, the bigger the battleship, the longer it takes to turn it around. But as David Belasco, a famous 19th-century stage producer, once said, 'Happy is the producer first on the ground with that which the public is clamoring for next.' You have to take some chances." Eventually, Sony Pictures Classics signed on, but as loyal fight fans (and those of other pop-cultural trends) now know, getting your hip new thing to the screen is merely the first hurdle. Quality assurance is another matter. Historically, when Hollywood elects to exploit, er, address a pop-culture trend, it has stumbled out of the gate. It took roughly 20 years for "8 Mile" to raise the bar set by early hip-hop films from the likes of the Fat Boys and Kid 'n Play, roughly the same amount of time it took Stacy Peralta's "Dogtown and Z-Boys" to erase skateboarders' memories of "Gleaming the Cube." Hollywood answered the bell last month with "Never Back Down," the first scripted feature about MMA, but the clich�-ridden flick about a bullied teen and his sage master from director Jeff Wadlow -- who previously had helmed "Cry Wolf," a thriller set at a boarding school -- played more like a music video, a "Fast and the Furious" meets "Karate Kid" for the brain-dead. To some die-hards, the film -- which earned $8 million its opening weekend and soon vacated movie houses -- was blasphemy, fuel to their fear that any big-screen incarnation of their sport would lose its essence, swallowed whole by studio suits who tend to digest flash and action and spit out the sweat, spirit and cauliflower ears. In Mamet, though, fight fans have not only a Tony-nominated playwright (for "Speed-the-Plow" and "Glengarry," which also landed him the Pulitzer Prize in '84) and a two-time Oscar nominee ("The Verdict" and "Wag the Dog") but also a man who's been through the ground-and-pound. The dudes who've been kicked in the chins are best-suited to lead the sport from the octagon into our imagination. It's why UFC darling Chuck Liddell is now a best-selling author. "Here's the difference -- this movie is not an attempt to capitalize on a phenomenon," says Mamet, when asked about "Never Back Down." "If it happens that, synergistically, there's a phenomenon out there that's going to help people get into the movie theaters, I'm happy for it. 'Wag the Dog,' my script about the president having an affair with an underage girl, came out exactly at the same time that the Clinton scandal broke. Nobody planned that. It worked out that way. The film must succeed on its merits." And it must never, ever sell out. As the sport stampedes into theaters with at least three more MMA feature films expected in the next two years, the question must be asked: How much is too much, and too soon? When does the romantic notion of a sport discovered, defended, and disseminated by its dedicated fans become a full-fledged sellout? "What would constitute selling out is dishonesty," Mamet says. "All drama is about lies -- lies that we tell each other, tell ourselves, give our lives to -- and coming to grips with those lies. Dishonesty is using a drama to tell a lie." "'Redbelt' is an accurate portrayal and, I think, an attractive portrayal. It takes you inside a world you haven't seen before, which is good because everybody loves backstage movies. But what it really tries to do is show what I understand the essence of jiu-jitsu to be. To a certain extend, I think I succeeded." Magno, for his part, says the film -- and the sport's move toward the spotlight -- has been good for business. His celebrity clientele, which also includes Val Kilmer, is growing and his Street Sports academy is expanding with a second location. And the raw violence and artistry of pro MMA fights is forcing Tinseltown to elevate the look of its on-screen fisticuffs, which explains why the likes of Couture, Liddell and Magno, who also works as a fight coordinator and occasional actor on Mamet's CBS series "The Unit" -- are finding more work on both sides of the camera. Yet, even as Magno sells products and services like a nutrition program (his wife is the nutritionist), T-shirts and his own line of instructional videos out of his storefront shop like hotcakes, he can't help but feel that the sport's sudden growth isn't all good. "It's become a big business very fast," he says, citing what's become the black-belt-mill mentality of some schools. "Academies here now sell black belts in two years. I hope the Brazilian community is staying strong, and not only thinking about the money, or 'I want to sell, make them buy, make a buck.' No, take your time, teach the technique, the approach, and improve the quality of the sport. "I hope the movie will give public respect for what people like Mike Terry do for the martial arts community," Magno continues. "He's a good guy who gives good quality training and cares for his students. And his students care about each other." With that, Magno heads to the mat, where an entertainment news crew is waiting for another "Redbelt" interview. As he speaks directly into a camera perched on a tripod, his students break into a staged sparring session, demonstrating jiu-jitsu techniques in the backdrop. And so continues the lesson from a school that lifted a student and the student that now props up a school. Though it's been a week since he trained, Mamet -- who is on course to receive his black belt in two years -- isn't sure if he'll be swapping sweat today. And if he does? Well, the outsider shouldn't expect an invitation to watch. "The great thing about this place is nobody but the serious people are here," he said earlier, citing a scene from the movie. "One of my favorite moments is when Emily Mortimer's character has a life-changing experience, loses control and starts to cry, and the hero says, 'It's OK, there's nobody here but the fighters.' That's one of the aspects of the story that I wanted to tell about an academy like this. "There's nobody here but the fighters. Nobody is going to lie to you about anything."